Harry, who has been removed because I want to use him for my Nano 2012 novel. Awwww, poor Harry, seems like a nice bloke…..so what can he do to get himself a girlfriend? This entry was tagged A-Z Challenge, Blogging From A-Z Challenge, Characterisation, characters, Creative writing, Krispy Kreme, Online Writing, Writer, Writer Resources, Writers Resources, Writing, Writing Prompts. Bookmark the permalink. ← Creativity Kick Up The….. 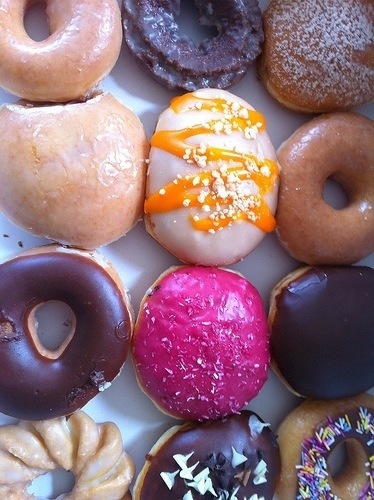 I want a donut so bad!! Aww! Well, maybe he can undertake a project or an adventure that gives him more confidence, and during that time he meets a nice girl. Great description of Harry! Sounds like an interesting character – even if he doesn’t think so. Awww, if I wasn’t married I’d date him. 🙂 Or set him up with a friend. Why are the nice ones always hiding?? Tell him to try this: (First a straight face.) “The management have sent me over to ask you to leave. Your stunning beauty is making everyone else look so ugly. (Then with a smile) “Could I buy you a drink and keep you all to myself?” What do you think? A fun read and tempting doughnuts, good job they are virtual! Harry sounds like a nice young man lol!